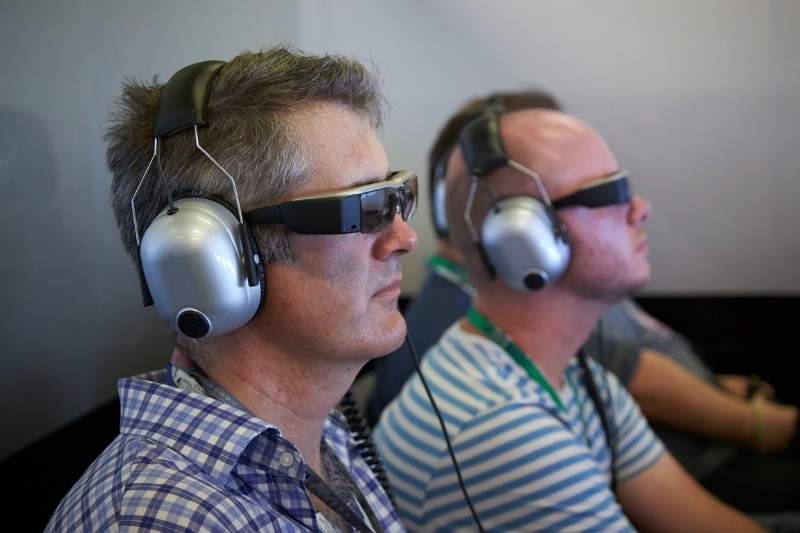 Mercedes and Epson are using augmented reality to enhance the F1 viewing experience from the track... and it could provide a glimpse into the future for you too. More than most - if not all - sports, Formula 1 is a multi-faceted, yet rather mysterious operation. In football, rugby, or tennis for instance, a match plays out over a standard pitch or court, the action remains contained predominantly in eye-shot and 'hidden' nuances are limited to what happens in the locker room during half-time or interval. In F1, however, the action is non-stop, stretches across a vast and varied area, where attention could be diverted from one corner to the next. The hidden nuances take place in the pit-lane, in the garage and beyond into the paddock behind it. There is so much more to drink in and appreciate, yet so much that is ultimately missed from behind a TV screen. As part of my privileged position as an F1 journalist, my access in the paddock gives me a remarkable opportunity afforded to precious few... but even then there are plenty of areas forbidden to us. Understandably. Which is why Mercedes Petronas AMG's invitation to experience a portion of an FP1 session during the Chinese Grand Prix from within the garage afforded us a welcome chance to admire a well-oiled, title-winning operation in action from a different angle. Better still, it also allowed us the opportunity to eavesdrop on Lewis Hamilton and Nico Rosberg's radio communications, as well as utilise an fascinating piece of technology created by Mercedes F1 partner Epson, which has developed Moverio BT-200 eyewear, more colloquially recognised as 'augmented reality glasses'. In its current application, the glasses are a remarkably innovative take on the standard guided tour of a garage, which either takes place during a session with obvious limitations or between the track action when you can get closer but the sensations are less tantalising. In this format, however, you can experience the hubbub of the activity, wince at the occasionally piercing sounds and taste the burnt fuel emanating from the W07 (particularly in this case after the extraction fan failed...). 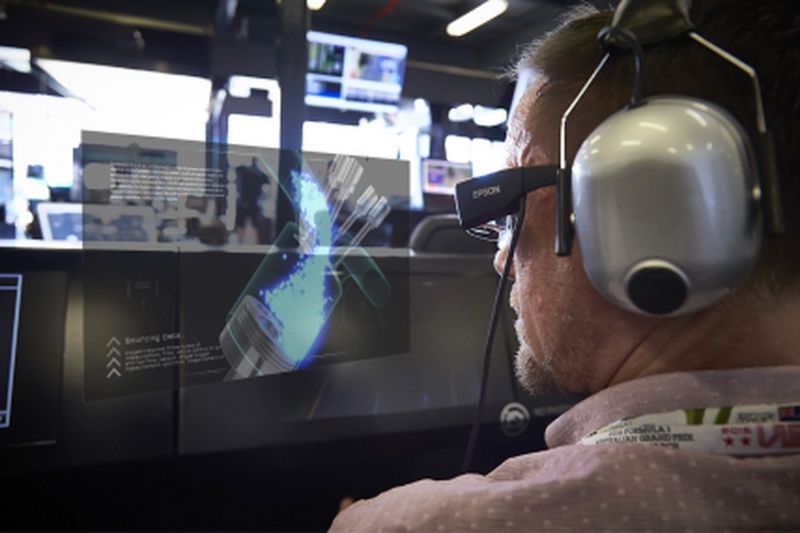 Add Epson's Moverio glasses though and, with the aid of carefully crafted visuals and graphics, you essentially gain a 'closer' understanding of the scene beyond, discover more about the technology of the car and be introduced to the drivers, engineers and personnel just feet away.. The function is seamless and simple, with far less intrusiveness to your vision than you would imagine, creating a unique visual supplement to a real-time experience. There is user-controlled functionality too. As the session continues on, a flick of the eye to a menu can bring up live timing, live social media streams (albeit not Snapchat as yet...) and complementary information about the car or the drivers. As a piece of intuitive kit, it's certainly eye-catching. Literally. Whilst the technology - which is still ultimately evolving - is currently limited for guests to enjoy from within the inner sanctum of Mercedes' marvellously slick garage operation, there is evidently scope to widen its use for both professional and entertainment purposes. Beyond that, it has a real-world application potentially for fans to supplement the viewing experience. Multi-screen technology has been available on TV for years, but Epson reckons this format has the potential to be integrated in a way that could allow you to ride on board with Lewis Hamilton or Nico Rosberg (should FOM allow it) and pick up data specific to Mercedes. All in real-time. F1 has been criticised in the past for its failure to integrate fans with access such as this, but mercifully many teams are going ahead and doing their own bit to raise the sport's profile within the defined licensing parameters, forging a personality and promoting their partners in increasingly forward-thinking ways such as this.